Online resource for providing ADA compliant kits for self storage units. 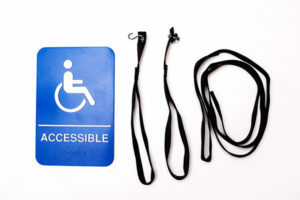 As of March 15, 2012, Title III of the Americans with Disabilities Act of 1990 (ADA) prohibits private entities from discriminating against individuals with disabilities by maintaining places of business that are not physically accessible. The Act requires that places of public accommodation remove architectural barriers that limit access to or use of the public place. The term “public accommodation” in the ADA generally encompasses all private businesses that offer goods and services to the public, including self storage facilities. 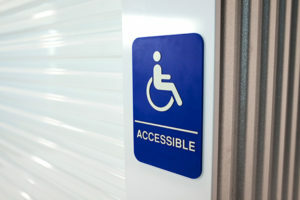 Although self storage operators are currently subject to all the ADA building access regulations applicable to structures generally, the 2010 Standards (ADA Accessibility Guidelines for Buildings and Facilities (ADAAG)) included space accessibility “scoping requirements” that provide that facilities must identify a specific number of units as accessible to be compliant. Based on these Standards, storage operators need to consider if they have thoroughly inspected their property for ADA compliance and whether a property audit is required. Door must be tensioned at 5lbs. maximum force as it pertains to the continuous application of force necessary to fully open a door, not the initial force needed to overcome the inertia of the door. Note: Janus doors meet this requirement. For exterior units, ramping is required which covers the entire width of the unit. Watch this video to hear industry experts discuss ADA requirements for self storage.